Each year, we translate millions of words in the leading tools that create and manage learning content, including Articulate, Captivate, Lectora, uPerform, PowerPoint and virtually every other learning technology. We actually localize several of the third-party tools as well. We provide SCORM-compliant, turnkey solutions that include simulations, video, audio, and Flash components, subtitles, and more. We’ve got the capability to deliver fully localized source content or complete, published courses, all tailored for your tools and processes. We control quality and turnaround time by performing key functions such as project management, localization engineering and desktop publishing, in-house. Our high-touch, customer service starts with a U.S.-based project team that coordinates closely with your team on planning, scheduling and timelines to provide rolling deliveries when you need them. You can count on us to meet your timeline each and every time. You’ll receive complete, end-to-end solutions that make localization far easier and far more effective than ever. 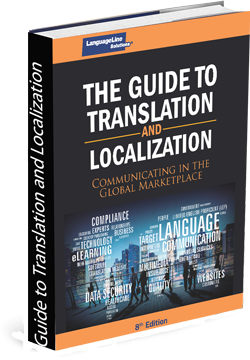 Download a free copy of LanguageLine's award-winning book, The Guide to Translation and Localization.